News: Switchfoot's New Album 'Native Tongue' Out Now! 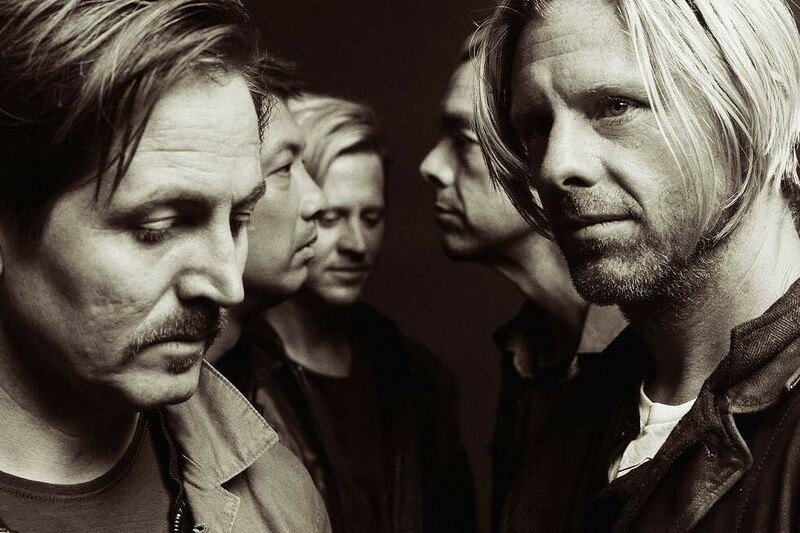 After taking a year-long break from touring, Switchfoot, a Grammy award-winning West Coast alt rock band, is hitting the road again. In January, they released their 11th album, “Native Tongue,” (Fantasy Records) an album frontman Jon Foreman says, is driven by joy. The album debuted on multiple music charts. The band’s sold-out Feb. 14 show in Asheville, N.C., is their first stop on a nationwide 44-city tour. Opening acts on the tour are solo artist singer and songwriter Tyson Motsenbocker and Colony House - an alt guitar rock band from the Nashville area. Switchfoot has partnered on this tour with Food for the Hungry, a Christian international relief, development, and advocacy organization. Jon and brother/bassist Tim Foreman, co-wrote most of the 14 songs on “Native Tongue.” The album takes listeners down some venturous avenues like The Beatles-vibed “Dig New Streams” and “The Hardest Art,” featuring M83’s Kaela Sinclair on vocals. Some of the tracks like “Let it Happen” return to the band’s earlier guitar rock sound, says drummer Chad Butler. And as always, veteran bandmates Drew Shirley (lead guitar) and Jerome Fontamillas (keyboards, guitar) add their virtuosity to the album. In a recent phone interview from the band’s home base in San Diego, Butler, 44, spoke ardently about the new album and tour. The affable son of a musician is an avid surfer and a devoted father. Back in the nineties, Butler met the Foreman brothers at the University of California at San Diego where they surfed and played music and eventually founded Switchfoot in 1996. They have been making music for more than two decades - and still surfing together whenever they get the chance. CS: You grew up in a spiritual musical household - how old were you when you started playing drums? CB: As long as I can remember, I was banging on pots and pans as a kid. I was surrounded by musical instruments because my Dad was a musician and really inspired me to follow suit. I do remember getting my first real drum kit when I was 13 and really leaned into it my high school years, playing in local bands and then in college, meeting Jon and Tim [Foreman] and starting the band that became Switchfoot. We were all on the surf team, playing music on the side. It was a crazy time of life, just playing music for the love of it - no aspirations of making it a career - but here we are 20 years later. It’s been a wild ride and I’m just so grateful to get to play music every day. CS: The band says in your trailer that ‘Native Tongue’ is the ‘most diverse’ album you’ve made and it might surprise fans/listeners. Can you elaborate? CB: Our approach to the songs is that each one can be its own unique statement, it can be its own sound and genre - there’s no limitations to the music to try to fit it all in one box. I think we really gave each song on the album freedom to develop. Some took a left turn back to our earlier sound like ‘Let It Happen’, the first song on the album - that guitar rock sound we have been known for. And some of the other ones are a little more adventurous - the song ‘Dig New Streams’ is probably the most wild piece of music we’ve ever made, it kinda goes all over the place stylistically. I love that about music - there’s no rules! CS: I especially liked your drumming on ‘Dig New Streams’ and ‘Take My Fire.’ Do you have a favorite song on the album to drum on? CB: ‘Take My Fire’ is definitely a fun one - I can’t wait to play that one live! It’s going to be our first time playing all these new songs live and we’re gearing up for it. We’re really excited to get on the road. CS: Earlier this year, Andy Argyrakis ranked all your albums in a piece in CCM Magazine and said your debut album, ‘The Legend of Chin,’ showed ‘evidence of a sincere yearning to seamlessly intersect faith and art.’ Is that the band’s intent? CB: I haven’t heard that before. That’s cool, I like that. It’s always interesting to hear other people’s opinions of your music. When you’re talking about faith and art, to me, those are interwoven. My faith is very important to me, it’s part of every aspect of my life - it’s not compartmentalized. I like the picture of weaving it together with the songs and the music, and allowing your innermost thoughts and your most vulnerable places to be open and honest in music. I think that’s the beauty of music - that you can be vulnerable and you can wrestle with things in life that maybe are difficult to talk about in everyday conversation. You can admit doubts, you can admit fears, you can wrestle with faith, all in a piece of music. And I think that’s been very significant in my life, in my journey. I hope these songs mean something to other people. CS: In an interview with Belief Net back in 2005, you described Switchfoot’s music as ‘honest rock music for thinking people.’ Does that still hold true? CB: I think so. I think the goal has always been to explore the world through the songs and to dive into the deeper things of life. I’ve viewed the last 11 albums as an ongoing conversation with our audience - asking questions and being real about the struggles and the joys of life. Some of my most fulfilling moments of being in this band are the conversations with people after a show, late at night, out on the sidewalk, running into someone who wants to share their story, of how the songs have connected with them. To hear people sing along with us each night is one of the most fulfilling things. CS: How is being in your mid-forties different on the road - versus 10, 20 years ago? Is it harder? Or are you just so accustomed to it, you just flow with it? CB: (laughs) I try to eat healthier, try to get more sleep - stay healthy on the road. Those are things I’ve learned. I think when you’re young, you can stay up all night driving the van to get to the next show, pushing the limits of your physical self to get where you want to go just because of the passion for the music and the opportunity in front of you. And now, I’m grateful for the moments we can pace ourselves and enjoy each day a little bit more. CS: So how do you spend your free time on the road outside of sound checks and shows and sleep? CB: I do a lot of FaceTime with my family. I’ve got kids at home now and I love to chat with them about their day and school and what’s going on back home. Sometimes I get to bring them on the road and get to share with them some of the experiences and the cities we’re in and those are great moments. CS: What are you listening to these days? CB: All kinds of stuff. One of the beautiful things about playlists and streaming is I can just scan a whole genre or mood and just let it play in the background and then when I hear something that catches my ear, I save it to my music - I love that discovery. I love when somebody posts a playlist or sends it to me personally, I really do listen with more intention because it’s from a friend. The band Colony House and Tyson Motsenbocker are good friends coming out with some good stuff - who I really look up to as songwriters and the integrity of their music. We’re excited to bring them on the road. CB: For us, the concept of this record, Native Tongue, seems really timely - the reminder that hate is not our native language - love is. I turn on the TV and it can be very overwhelming right now in the world. I do believe in love, and the song and the album is a reflection of that, the importance of remembering what is most common between each of us, and what our original native tongue was.